Headquartered in Boulder, Colorado, Transformance Advisors (TA) provides consulting and educational services for lean transformations, strategy execution, and supply chain management. Large international clients depend upon TA for expert advice and often require “road warrior” support for projects across the globe. The company also has many local clients that tend to seek structured programs that combine consulting advice integrated with educational events. A third market segment includes organizations that send people to public educational events or bring instructors onsite for private classes. It became obvious that the long term health of the company required the leadership team to step back and refine the strategy. (It had been four years since the last strategy planning retreat.) Maybe it was a coincidence, or maybe it was a sign, but at this time, TA received an inquiry from Six Disciplines about becoming a partner and offering the Six Disciplines program to clients. 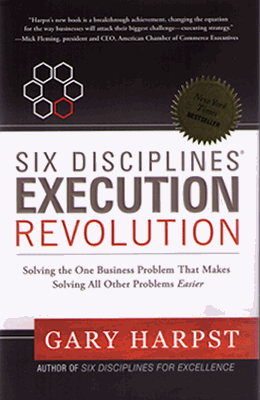 After reading two books by Gary Harpst (Six Disciplines Execution Revolution and Six Disciplines for Excellence), the TA leadership team felt that a partnership with Six Disciplines was a perfect idea. The Six Disciplines program has a similar structure to the lean transformation program offered by Transformance Advisors and it would be an excellent service to meet the needs of clients and prospects. In addition, Six Disciplines was exactly what the TA leadership team needed for refining the current strategy and then executing the plans. Seeking to “walk the talk”, the TA leadership team challenged Matt Lauth, a certified Six Disciplines coach from Strategy Execution Advisors to achieve two objectives. The first was to coach the TA team through the entire Six Disciplines program. This would include refining the vision, establishing a balanced scorecard of measurements, crafting strategic initiatives, and executing the plans. The second objective was to help TA establish certified coaches and become a partner in the Six Disciplines community. Matt accepted the challenge and coached the TA team through the Six Disciplines program. Following the kick-off meeting, the team surveyed all stakeholders and read numerous articles in preparation for the two day planning retreat. Matt exceeded expectations by securing Gary Harpst as a guest facilitator for the TA planning retreat in Boulder. A tag team approach by Matt and Gary provided energizing and productive sessions as the team systematically refined their vision, mission, values, strategic position, and balanced scorecard during day one of the planning retreat. Day two included discussion and debate as the team crafted five strategic initiatives that would be required to reach the goals identified on day one. The innovative Six Disciplines software supported the entire process and provided an excellent means to capture all elements of the strategy. Following the planning retreat, Matt coached the team through initiative workshops that provided a successful launch for each strategic initiative. The next step involved setting individual plans with projects, action items, and tasks required for working each initiative. The Six Disciplines software continued to shine as everyone could see the clear alignment from vision to individual activities. It also became obvious on “what not to do” and these unaligned activities were quickly discontinued. The team is now working projects, action items, and tasks for each initiative. There is a weekly process for individuals to review their progress and a quarterly process for the team to review and refine the plans. In parallel to coaching the TA team to work the Six Disciplines program, Matt also provided the training required for TA to become a partner and begin coaching other organizations. It’s easy to see the puzzle coming together. For example: one the five strategic initiatives for TA is adding Six Disciplines as a new service; this supports the vision and the Six Disciplines program provides the means for everyone to stay aligned and work the activities required to add the new service! Coaching from Matt, following the methodology, leveraging the software, and joining the Six Disciplines community has taken TA to a much higher level of performance. The five strategic initiatives developed during the planning retreat have proven to be the right course of action. The ability to execute the strategy has produced dramatic results. Some examples include the release of several online courses, creation of a comprehensive lean transformation program, and the launch of Six Disciplines as a new service. Clients are one measure of success. In this area, TA made the Mercury 100 list and has been recognized by the Boulder County Business Report as the sixth fastest growing small company in Boulder County. Another measure of success is quality of life for the TA team and this has also seen dramatic improvement. Workloads are much more balanced and key members of the leadership team are able to work on the business. 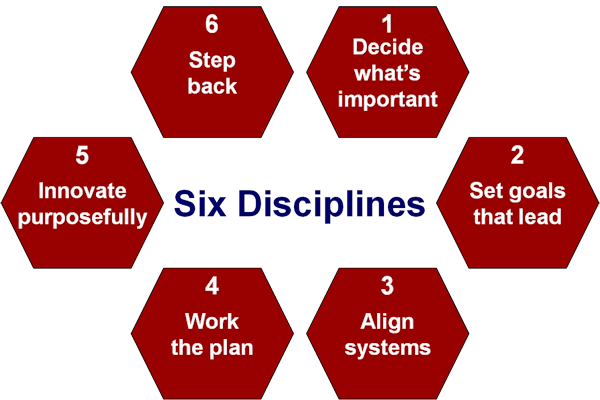 Contact the team at Transformance Advisors for information on how you can improve your performance by utilizing the Six Disciplines strategy execution program.